Twenty-five years ago today, IBM scientist Georg Bednorz received a call from the Nobel Committee, coincidentally while he was traveling in Stockholm, to tell him that he will receive the 1987 Nobel Prize for Physics for his work in high-temperature superconductivity. His fellow colleague and scientist K. Alex Müller received the same call while at a conference in Naples, Italy. Perhaps Müller was a bit less surprised as he now famously said “this paper is going to make history” to his daughter during dinner, after submitting his discovery to a scientific journal. And it sure did – in record time. 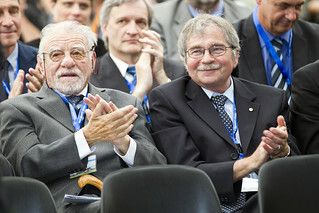 It took only 22 months for the Nobel committee to honor Bednorz and Müller with the Nobel Prize. The paper, “Possible High Tc Superconductivity in the Ba – La – Cu – O System” was first published in a German journal called Zeitschrift für Physik B. The two were keenly aware that the discovery was so incredible that they even doubted themselves. The commercial benefits stemming from superconductors are just now reaching the market. For example, energy efficient, high temperature superconductor (HTS) power cables from American Superconductor are beginning to roll out around the world. In 2008, the longest and first HTS cable was installed on Long Island, New York and is currently transmitting up to 574 MW of electricity – enough to power 300,000 homes. In the mid-western United States, the Tres Amigas Project is currently underway to link three power grids and create and nation’s first renewable energy market hub. In the metal processing industry large machines called billet heaters use electricity to heat metals to 1,100 deg C (2,012 deg F) to soften them before processing. Using high-temperature superconductivity, the German company Bültmann GmbH has developed a magnetic billet heater that is 80 percent efficient, saving the equivalent of 800 barrels of oil per year. In the future, Magnetic Levitating Trains (Maglev) will use on-board magnets that levitate the train above the steel rails, making them more energy efficient and faster. Initial testing of Maglev trains in Japan have recorded speeds at 581 kilometers per hour (361 mph). While the discovery remains many years away from broader adoption, its promise is apparent and its potential seems limited only by the imagination of science.